Rory McIlroy returned to normal service on the Earth Course at Jumeirah Golf Estates in Dubai today after blaming the fact he was still in “holiday mode” for his poor start in the $8 million DP World Tour Championship. The defending champion was out in the second group on day two of the European Tour’s season finale after an opening 75 - the first time in 29 rounds that he’d been over par on the Greg Norman-designed layout. Playing with Ryder Cup team-mate Andy Sullivan, McIlroy enjoyed a seven-shot improvement as he signed for a four-under 68 to move to one-under for the tournament and raise hopes that he could still get into the mix over the weekend. 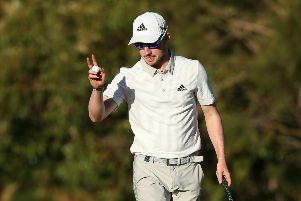 “It’s been a while and it’s certainly not what I’m used to here,” said the 27-year-old, smiling, of his early start after ending the first round trailing the leader, Englishman Lee Westwood, by nine shots in the battle for a top prize worth more than £1 million. McIlroy started his second circuit by failing to convert a great birdie chance at the first. He did pick up a shot at the par-5 second, though, before making a bogey at the fourth - a 245-yard par 3 - for the second day in a row. He’d also dropped a shot at the sixth, the other short hole on the front nine, in the opening round but hit a majestic approach to six feet on this occasion for a birdie that seemed to be the spark he’d been needing. The four-time major winner also birdied the next two holes, narrowly missing an eagle attempt at the long seventh before rolling in a 10-footer at the eighth. He then bogeyed the ninth after driving into a fairway bunker to reach the turn in 34 before picking up birdies at the two par-5s on the back nine - the 14th and 18th - to make it a good morning’s work. As Westwood, who led by one overnight, prepared to head out, McIlroy said he was off to put his feet up. “I’ll be at the pool by 12.30, which isn’t a bad thing,” he joked. Sullivan, who played with McIlroy in the final group in the last round 12 months ago as the pair battled it out for the title, signed for a 66 to move to two-under for the tournament.